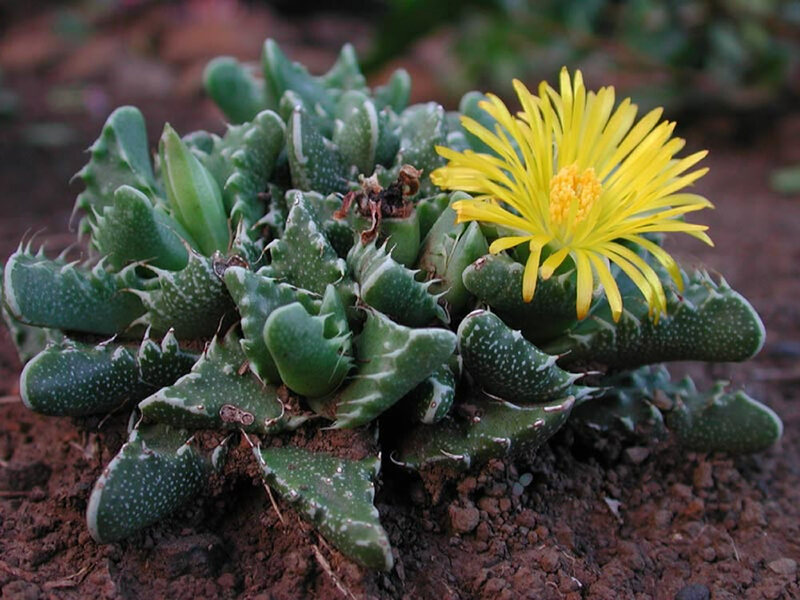 Distribution and habitat: Faucaria tigrina is a subtropical succulent plant native of South Africa in eastern Cape Province thicket and savanna and the Karoo desert. It is found in open, rocky patches, in a dark clay soil with a low pH, in mountain renosterveld. The Latin name for these succulent house plants is Faucaria meaning jaws and tigrina meaning tiger. The ‘teeth’ of the Faucaria tigrina however, are actually soft and harmless, and help to trap moist fog and direct it down to the roots. Fog that comes in from the coast provides a precious source of water for plants surviving in the hot, arid thickets. 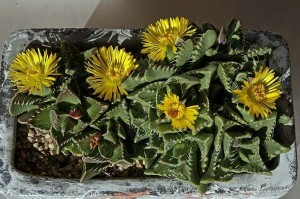 Description: Faucaria tigrina are low growing succulent plants with four or five layers of leaves arranged in criss-cross opposite pairs, forming a thick, star shaped rosette. Each pair of leaves is united at the base and these are virtually no stems. The leaves are fleshy and pointed, 2-5cm (0.8-2 inch) long and 2cm (0.8 inch) broad at the base. The roughly triangular leaves, which are usually edged with soft and bristle-like hooked teeth, have a flat upper surface, but the underside is convex. Leaf colour is greyish green marked with many small white dots. The teeth on the edge of the young leaves interlock, but they later strengthen and separate to give a jaw like appearance. The plants send out basal offsets that form crowded clumps. Relatively large, daisy-like flowers, which generally open in the afternoon, are produced from between the leaves in autumn. They are attractive golden yellow, stalk-less and can be up to 5cm (2 inch) wide. 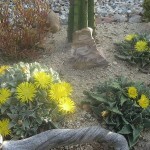 Proper care: The plants in this genus represent some of the more easily cultivated succulent species. 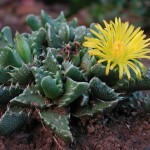 Light: Faucaria tigrina must have at least three hours a day of direct sunlight all year long in order to flower. 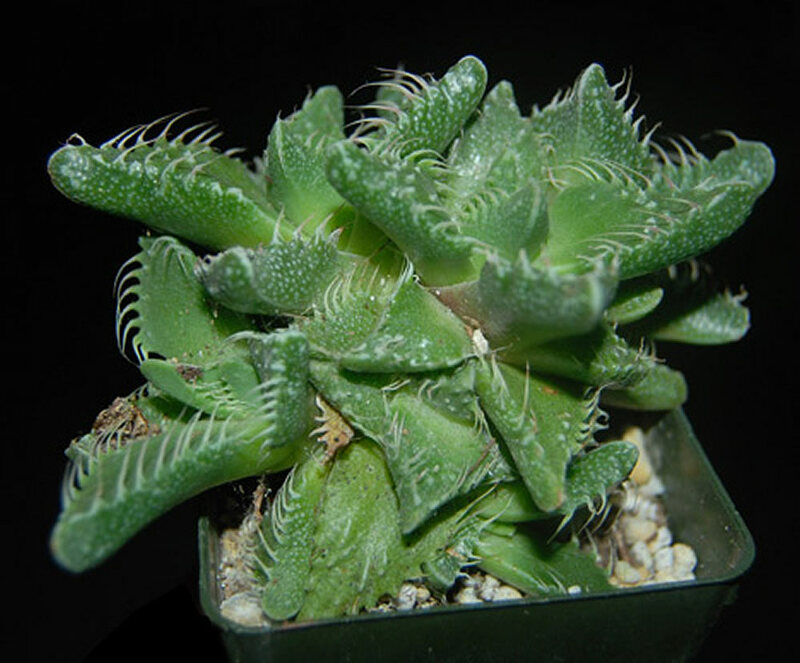 Temperature: Faucaria tigrina needs warmer temperatures from spring through fall 21-32°C (70-90°F). It needs average temperatures in winter, 16-24°C (60-75°F). If the plant is moved outdoors for the summer, be sure to bring it back indoors when nighttime temperatures drop below 16°C (60°F). This succulent plant requires an average to dry humidity. Water: Keep Faucaria tigrina soil lightly moist spring through fall. In winter, allow soil to dry out between waterings. Feeding: During the active growth period only, apply standard liquid fertiliser at half-strength once or twice during growth period. Too frequent feeding will result in soft, uncharacteristic growth. Potting and repotting: Use a mixture composed of two parts of soil-based mixture to one part of coarse sand or grit. Because Faucaria tigrina have relatively little root, plant them in shallow pans or half-pots. When a clump has covered the surface of the potting mixture, move plants into a container one size larger. Repotting should be necessary, however, only one in two or three years. The best time to pot is early spring. Gardening: In areas prone to frost, Faucaria tigrina should be overwintered in an intermediate greenhouse or conservatory, in pots of cactus compost. Although the plants will survive mild frost if kept dry – hardy as low as -5°C (23°F) – they should be protected from frost to prevent scarring. Faucarias become woody and untidy as they age. New plants can be started by cutting a rosette and planting it. Position: Faucaria tigrina plants need full sun to light shade. Keep them shaded in summer, but provide maximum light the rest of the year. They do not do well in full shade as they tend to etiolate, fall over and rot easily. Soil: Faucaria tigrina need to be located in an accentuated and drained substratum. The substrate should be gritty-sandy soil. They thrive on a little compost and some fine mulch spread between the plants would also be a good idea. These succulent plants will grow in a well-drained soil mix, but can tolerate a wide variety of soil types and growing locations as long as there is plenty of sun. Irrigation: Faucaria tigrina is native to a primarily summer rainfall area but in cultivation the plant can be watered year-round. The plants are well watered during the growing season and allowed to dry thoroughly before watering again and will tolerate some over watering, but the challenge is to help them keep their compact form and prevent elongation of the stem. Faucaria tigrina plants grow on winter rain and were heading for spring-summer dormancy. Requires little water otherwise their epidermis breaks (resulting in unsightly scars). Water moderately from the middle of summer to the end of winter and keep the compost almost dry when the plants are dormant. Water minimally in spring and summer, only when the plant starts shriveling (but they will generally grow even in summer if given water). Fertiliser: Faucaria tigrina plants should be fertilised only once during the growing season with a balanced fertilizer diluted to half the recommended strength. Propagation: Carefully divide overcrowded clumps of Faucaria tigrina in late spring or early summer just after plants have restarted into growth. As individual plants are separated, some will come away with their roots attached. Insert each such rooted Faucaria tigrina directly into an 8cm or 10cm (3-4 inch) container of the recommended potting mixture and treat the new plant as a mature specimen. 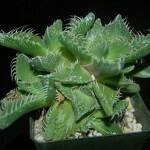 For the first week or two, however, keep the Faucaria tigrina in medium light, well out of direct sunlight. An individual plant without roots attached should be left unpotted for a few days to let the base of the plant harden. It may then be inserted in the recommended potting mixture. Surround the base with some additional coarse sand. This will help to prevent rotting and encourage the development of roots. Keep the plant in medium light and water only moderately until new growth indicates that rooting has occurred. Thereafter, treat the young plant as a mature Faucaria tigrina. The spring weather, with a high temperature swing between the day and night hours and pretty frequent rains, can favour the development of fungus diseases (phytophthora) indicated by sudden wilting and pale green discolouration. Treatement: Remove infected plants and treat remaining plants preemptively with a systemic fungicide, before the gems grow excessively. Avoid fungus infections by improving drainage and over-fertilization. Waxy fibres and honeydew on leaves and shoots indicate an infestation with mealybugs. Scale insects sit on the undersides of the leaves. Treatment: At the end of the winter a wide range insecticide is recommended to be applied to prevent the insects attack. It is recommended to do these treatments when there are not flowerings in the garden. Alternatively, control biologically with predatory ladybirds or parasitic wasps can be used in garden. Note: Continued urban development and over-grazing within its current natural habitat means Faucaria tigrina plant is classed as endangered in the wild. 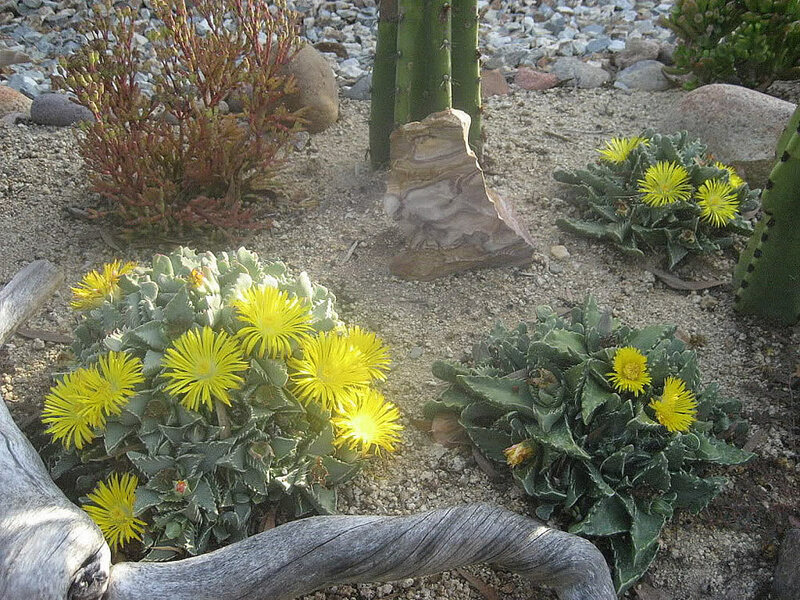 Uses and display: Faucaria tigrina is used as a border or filler plant in rock gardens, xeriscaping or wild gardens. It will attract bees, butterflies and other insects into the garden. It is a suitable succulent plant for smaller gardens and can be used to stabilise banks and and reduce land erosion. Although it can be grown just as easily indoors as windowsill plant, being well suited to growing in containers and pots.